Foundation Mid (2v2) out now in Gears of War 4 Private Play! Surprise! As of yesterday’s Gears Esports Fight Night, a brand new 2v2 map, Foundation Mid, is now available in Gears 4 Private Matches! When we brought Boxes and our 2v2 Gnashers Only playlist to Gears of War 4, we saw an overwhelming number of players flock to the playlist. Today, 2v2 Gnashers Only still stands as one of the most popular playlists in Gears of War 4. It’s time to add one more map to the 2v2 lineup to vary the experience and provide some strategy into your map picks. Enter Foundation Mid, which takes the iconic Open and Closed mid lane fights from Foundation and closes off the map to turn them into the ultimate 2v2 arena! If you missed last night’s Gears Fight Night, you can watch the first footage of the match in action on demand here. Foundation Mid is available now in Private Match and will be entering 2v2 Gnashers Only Ranked with the arrival of Ranked Season 6! Speaking of Season 6, the end of Season 5 is fast approaching with just under 3 weeks left on the clock to get your highest placements and complete the Seasonal character challenges. For those who have achieved or aspire to reach the heights of Diamond 5 in Season 5, we know you’ve been keen to see this Season’s Emblem for the most elite players out there. Feast your eyes on this blood bathed beauty below! The Season 5 Diamond Master Emblem will roll out shortly after Season Stats appear on the website after the end of the Season (which we estimate in around 4-6 weeks after the Season ends due to data processing and cultivation). Don’t worry though – whilst you wait, we’ll be giving you a look at the Ranked Season 6 Diamond Master Emblem right as we start the season. Good luck on that grind, Gears. It’s time to watch, learn and play Escalation next week as we get ready for another epic Gears Pro Circuit event in Mexico City! Beginning on Wednesday, January 30th, Core Escalation will make its return for one week packed with 4XP for the duration of its stay. For fans who want the original Escalation experience, we’ll also be juicing the competitive playlist with 4XP too. Don’t forget to tune in to Mexico City next weekend beginning Friday, February 1st to watch the best players in the world do their thing, to pick up some free weapon skins and to take away some new skills for those XP laden Escalation matches. 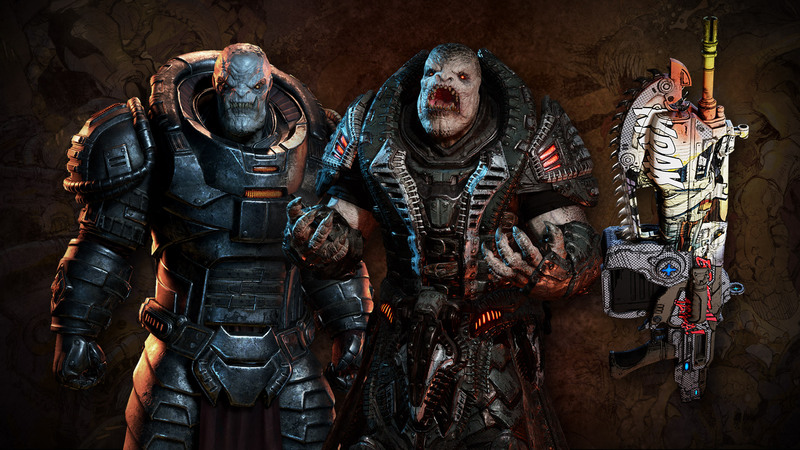 This weeks' returning Gear Pack is the Rise of RAAM Pack, featuring Uzil Sraak, Vold RAAM, Comic Book Weapon Skins and a Rise of RAAM themed emblem! The Rise of RAAM Pack is available as a 400 Credit 3-card Gear Pack and the monetary-option of Mega Packs from Friday 25th January - Friday February 1st. There’s been plenty of Gears 4 goodness to chew on this month, with the Classic Golden Gear Challenge and the new Theron Gear Pack to name just a couple, but we felt it’s time we give you a look at the coming weeks! 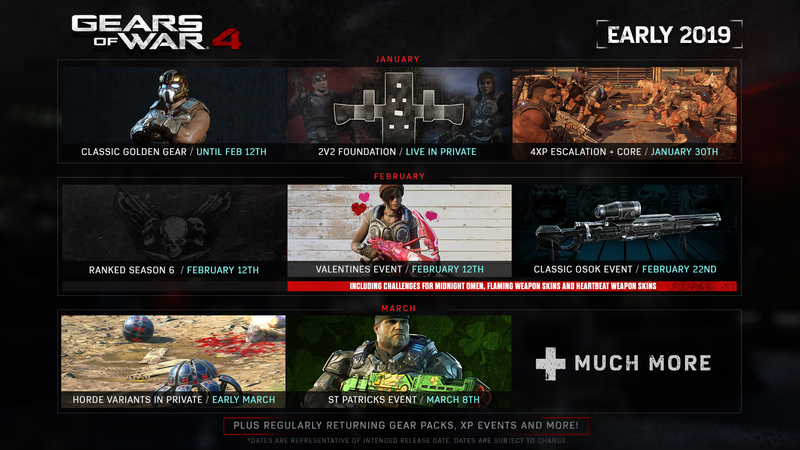 Here’s the next 6 weeks of events and challenges coming up in Gears 4. And, yes, there is definitely more to come after the next 6 weeks too. The $200,000 Gears Pro Circuit Mexico City Open is a little over a week away, and if this week’s Gears Fight Night is any indication, it could be shaping up to be the biggest and best yet. This week’s show featured both the Latin American 2K finals between Ghost Gaming and Fire N Ice, the North American 2K finals between Fight Night newcomers Buddy Buddy and Treyway, the Mexico City Pool Play draw and the announcement of a 2v2 side tourney on the brand new Foundation Mid map. Kicking off with a clash between two of the top teams in the LATAM region, this week’s Latin American 2K final offered us our first chance to see the new Ghost Gaming squad in regional action after debuting against OpTic Gaming last week. Suffice to say, the squad formerly known as “LATAM Kings” lived up to their name, decimating Fire N Ice in conclusive fashion, only dropping one round in the process. Whether or not this success will translate on the international stage remains to be seen, but this new Ghost squad is looking dangerous coming into their first Pro Circuit event. 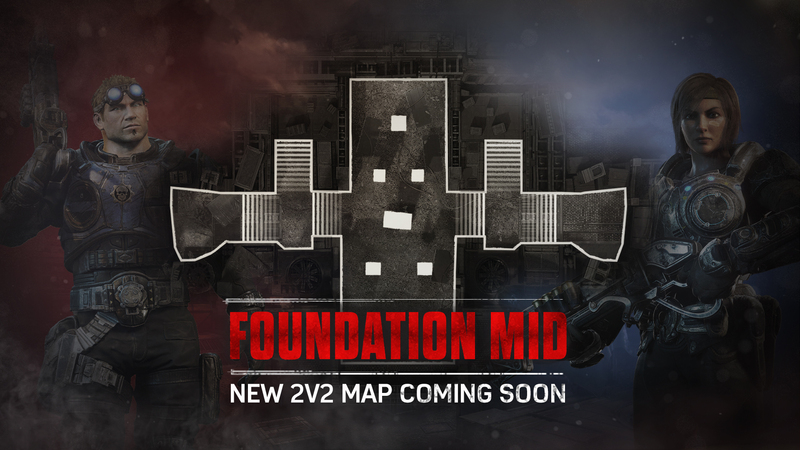 Speaking of the upcoming event, last night’s broadcast also featured the announcement of a 2v2 Gnashers Only side-tournament on the new Foundation Mid map. Like the tournament in San Diego, the competition will be free to enter and feature a $10,000 prize pool divided amongst the top 4 teams. It is open to all event attendees over the age of 18 (granted your team isn’t still competing in the main tournament), with registration taking place on site. Stay tuned for more details, but if you intend on playing in this tourney please make sure to bring a controller and headphones. Our second match of the night, the North American 2K final, featured a couple of new squads making their Gears Fight Night debut. 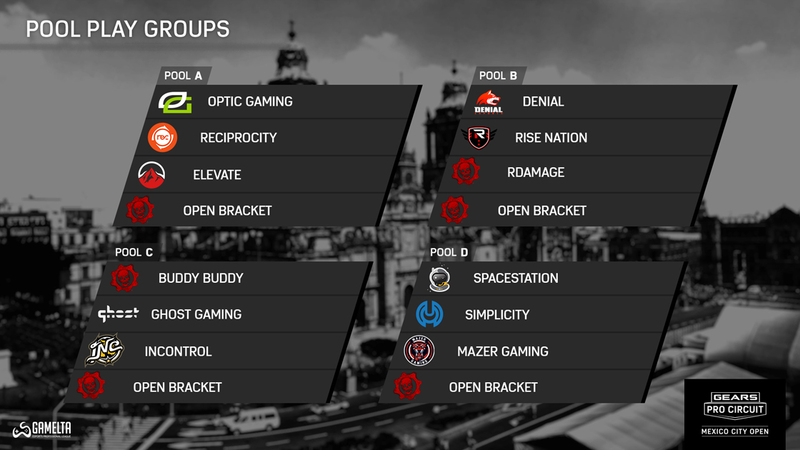 After knocking out reigning champs OpTic Gaming in their second round of competition, Treyway (seeded 16th) would go on to dispatch Mazer and Simplicity on route to their match against Buddy Buddy (seeded 3rd) in the finals. Although it looked like their upset streak was going to continue following a 7-2 victory on map one, the top level slaying power of Buddy Buddy would prove to be too much for them to handle, with the third overall seed taking maps two and three, 7-2, 7-4 respectively. With perhaps our most competitive groups to date, the Mexico City Pool Play groups are chalk full of top flight talent and bad blood, with a number of former teammates facing off to determine who will get the inside track on the Championship Winner’s Bracket and who will need to battle their way through the gauntlet that is the Loser’s side. Mexico City Open broadcast kicks off next week at 2PM CT. You won’t want to miss a second of this one. Introducing TNM Pillotai, hailing from Mexico. On his channel, his goal is to offer Gears fans a chance to learn more about the lore of the series where he goes in depth into Gears’ history, narrative, characters and more. A fan himself ever since he picked up Gears 2, TNM Pillotai has devoted a lot of time to keep expanding his knowledge, and sometimes his passion for the series has driven him to create his own fan theories. He started uploading content 4 years ago, and through time, experience and research, he has come to believe that each Gears game is unique in its own way. Make sure to check out his channel if you are into Gears secrets as he is! JONATHAN HARPER ¡EL PERSONAJE QUE NUNCA SALIO EN GEARS OF WAR 2! 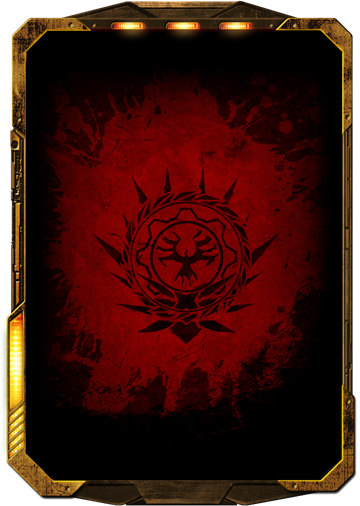 Claim another Canadian Omen skin for free (Markza today), play Gears 4 with us and get your questions answered.